Strong, flexible, gorgeous nails for life's daily activities. Sculpt, extend, shape for a naturally polished look. High-performance sculpting forms for natural-looking enhancements with a clean deep "C" curve. 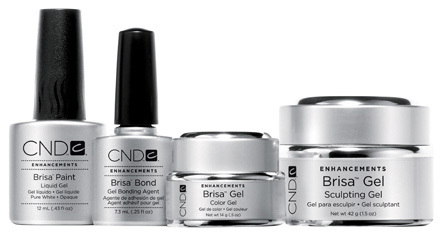 Create gorgeous, thin, natural-looking gel enhancements with CND’s patented technology. BRISA® Sculpting Gels are strong, flexible, gorgeous nails for life's daily activities. Sculpt, extend, shape for a naturally polished look. BRISA® Paints are thin liquid gel paints that create crisp smile lines that last three times longer than ordinary French manicures. Prime the nail with BRISA® Bond, a UV-cured bonding agent that securely adheres BRISA® gel to the natural nail. Finish with BRISA® Gloss, a high-gloss gel top coat that seals and protects enhancements.